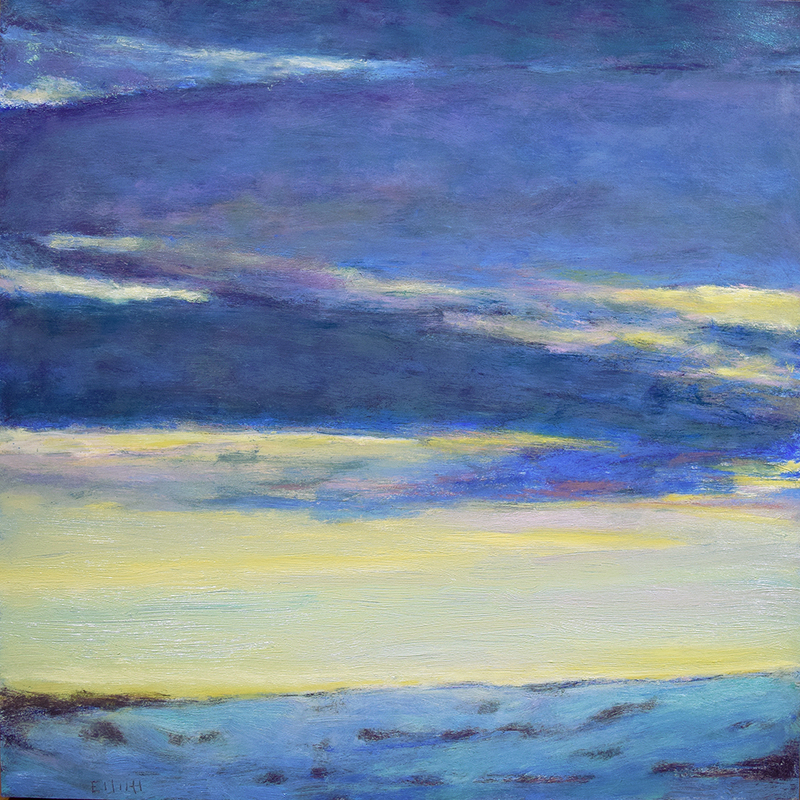 Looking out over the snow covered fields, I became enamored of the many of blues in combination. Compositionally, I was looking for something interesting in the stark fields when I noticed that the cloud forms held an array of blues as well. The clouds were a perfect counterpart to the simple landscape below and more interesting than the fields on their own. It was a very still and quiet day with the sunset just beginning to add the yellows and pinks to everything. With those warm colors added in, the scene came to life, making a place where all of the blues could gather harmoniously. With this view of the forest, the colors are very unnatural but the result is believable and interesting. 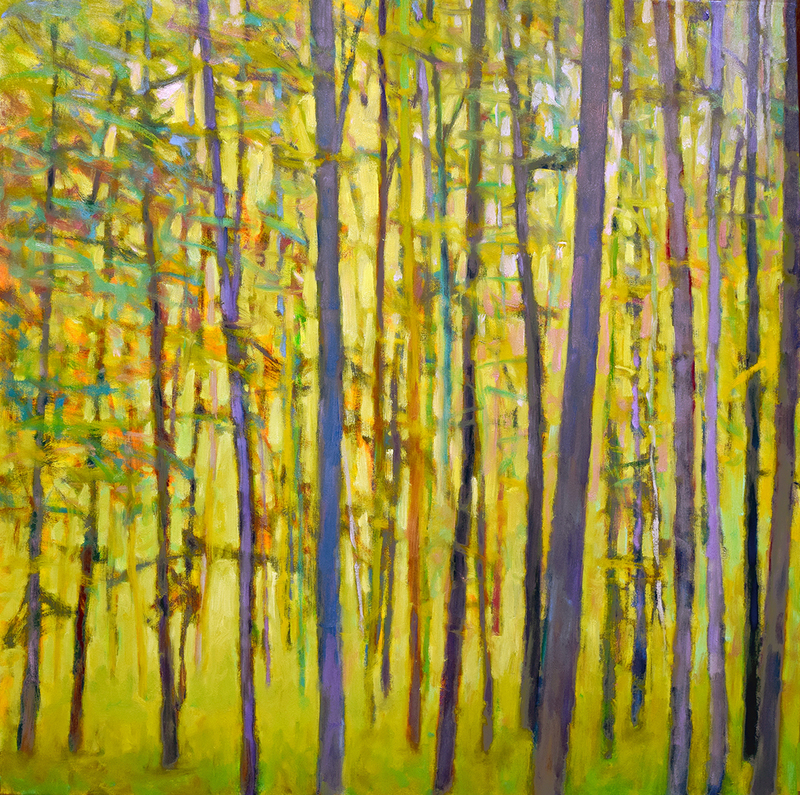 While painting this oil I continued to lay in new colors, pushing this forest view beyond the typical portrait of a place. This wood doesn't exist in nature but it easily recognizable for what it is, a stand of trees receding into space. As the painting developed, different lighting options were tried out: color, brightness, shadows-no shadows and more. Finally, I decided on a soft, yellow glow that permeated everything, making it difficult to find the source of the light. There is a bit of sky in the upper right, but it's not a focal point and that is the nature of this Saccades series. The composition draws the eye across the canvas in all directions without resting. It's an interesting result seeing this oil on the wall because the entire canvas becomes an art object rather than a picture of a place. 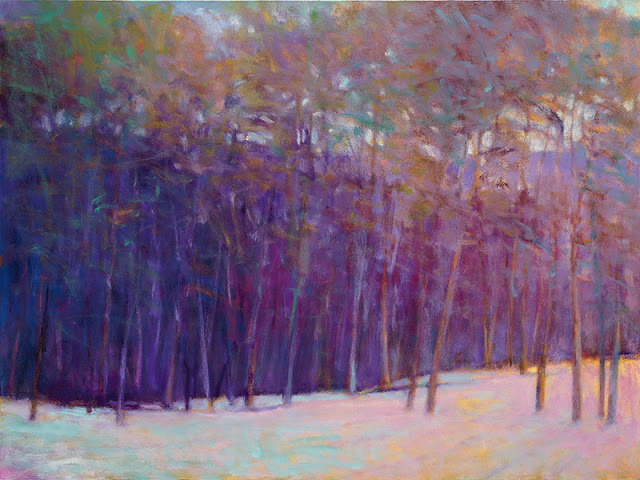 The large oil transcends the pictorial and becomes a glowing presence in the room. It was a satisfying task to create this delightful and intriguing place. Open to artists in all media. Ken will discuss strategies for creating better artworks with a variety of common and creative tools. The workshop will focus the strategies for making better artworks, going to new places in your work and how to make fine art. He will use informative videos and pass on strategies not the literature, but handed down from the very best teachers. 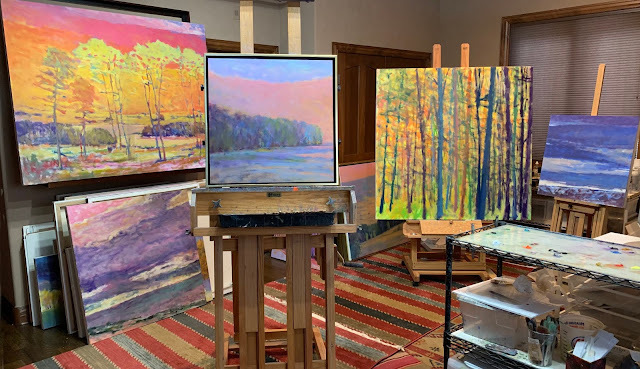 After a few days making new starts in oil, it's good to look back at that group of paintings and evaluate where things are headed. Every oil has its own personality by now and each presents a unique set of obstacles to overcome. At the end of the day today that's exactly why I stopped working on this group. But then there was still some daylight, so a grabbed a pre-stretched 48 x 60 canvas and began another problem child, making 7 canvases now in progress, two that are not in this shot. Having all of this interesting, raw material around makes me look forward to tomorrows session where I will work on one canvas after another, inching them forward to completion.... or not sometimes. Its glorious work when it goes well, otherwise those unruly canvases end up in a stack on the floor at the bottom right for another chance or to be painted over. This is not a loss, just a delayed opportunity.